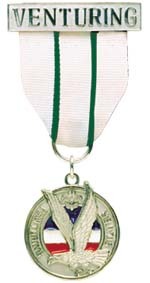 Earn the Venturing Gold Award. Become certified in Standard First Aid or equivalent course. If you choose the American Red Cross Standard First Aid version of the course, the curriculum includes how to recognize an emergency and overcome the reluctance to react; how to recognize and care for breathing and cardiac emergencies in adults (training to care for infants and children is optional); and how to identify and care for life-threatening bleeding, sudden illness, and injury. The course is approximately 6½ hours. Your Standard First Aid certification will expire three years from the date of issue. Your CPR certification will expire one year from the date of issue. If you hold an unexpired certification in this or a higher course, you can receive credit for this requirement. However, you must be currently certified at the time of your Silver Award crew review. You are encouraged to get certified as soon as possible and stay certified. For this requirement, you are not required to seek a higher certification, but you are encouraged to get certifications in higher-level course such as Wilderness First Aid or Emergency Response. You will be even more prepared. Note: If you need help finding an American Red Cross instructor in your area, call your local Red Cross chapter. For literature, call toll-free 1-800-667-2968). Become certified in CPR. You can take a stand-alone CPR course or take it as part of another course such as Standard First Aid. Please remember that CPR certification lasts for only one year, at which time you will need a refresher course. Like Standard First Aid,. it is good to always be current in your CPR certification. You most likely will get an opportunity to use your skill in saving a life. Complete the BSA Safe Swim Defense training course. In this course, you will learn how each of the eight points of the Safe Swim program affects safe crew swimming activities. You will learn that qualified supervision and discipline are the two most important points, upon which the other points rely. You will also learn how to set up a safe swim area. Any BSA aquatics resource person, your crew Advisors, or other council-authorized individual can provide the training course for you. Use Safe Swim Defense, No. 34370, and Safe Swim Defense Training Outline, No. 19-417. Either lead or participate in a group swim using BSA Safe Swim Defense. Swimming can be a great way for you and your crew members to stay fit and to just have fun. To ensure that you and your friends will continue to do just that, always insist you use Safe Swim Defense. Successfully complete the Venturing Leadership Skills Course. Successfully serve for at least six months in an elected or appointed crew, district, or council leadership position. Since leadership is a form of service to others, don't be afraid to ask your followers, those you serve, how you are doing. If you don't have an occasional assessment of your progress, you might not improve. Learn to value the opinion of others. Service as a den Chief qualifies for this requirement. This must be in addition to the leadership requirement in the Venturing Gold Award. Either organize and lead, or help to organize and lead, an Ethics Forum for your crew, another crew, school class, or other youth group. An Ethics Forum is simply another, more formal, way of gathering information about ethics. You will invite two or more adults to form a panel for your crew or group to ask questions about ethics in their personal or professional lives. You can even invite adults related to your crew's specialty; if you are in a sports crew, you could invite a sports doctor, a coach, and a professional athlete. You can even invite guests such as family members and friends to join you. You can even use the information gathered from the Ethics Forum to develop your own Ethical Controversies activities. After completing all requirements, the candidate should prepare evidence of completion of work. It should be submitted to the crew Advisor along with the completed and personally signed Silver Award Progress Record and Application. The crew president, in conjunction with the crew Advisor, should then appoint a review committee of four to six people including Venturers and adults. The review committee should review the candidate's written documentation and interview the candidate to determine whether the candidate complete all work and grew as a result of the pursuit of the Silver Award. The application is then approved by the crew Advisor and crew committee chairman and submitted to your council service center. The Youth Development Team at the national office must be contacted for procedures to follow if the review is conducted more than six months after the candidate's 21st birthday.